To start a finance business in India, there are only two options which are available to the entrepreneur, one is banking companies and other is Non-banking companies. There can be other forms as well as cooperative society, multistate society etc., however, they are very limited in their sense. Hence, broadly the finance business in India can only be classified into the above two categories. As said, both the above category is governed by the Reserve Bank of India (RBI) except few forms of Non-Banking companies like housing finance companies, chit fund company, Nidhi Companies. In this article, we shall discuss the Nidhi Company and the related regulations in brief. Nidhi Company has gained a lot of popularity in the recent times because all other forms of business for finance business has been suspended like section 8 microfinance, multistate society etc. Nidhi Company is rather easy to form as compared to other forms of NBFC and require less capital contribution than any other finance company. 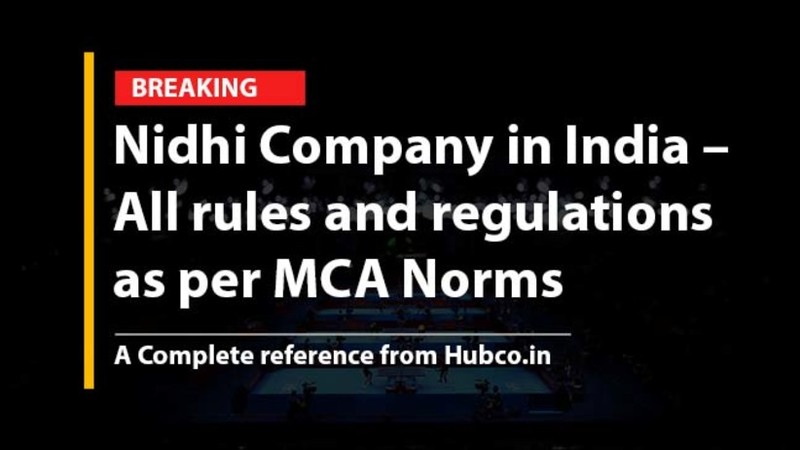 Let us understand the rules and regulations relating to Nidhi Companies in India. Out of the seven, three may be the directors of the Company. Need to have minimum documentation for Nidhi Company Registration like PAN, id proof and address proof. If you can fulfill the above criteria, then we can proceed with Nidhi Company registration. Unencumbered term deposits of not less than 10% of the outstanding deposits. The ratio of net owned fund to deposits of not more than 1:20. If the company is failed to comply with the above requirement, then the same needs to apply for an extension with the regional director inform NDH – 2. No Nidhi Company shall acquire another company by purchase of securities or control the composition of the Board of Directors of any other company in any manner whatsoever or enter into any arrangement for the change of its management, unless it has passed a special resolution in its general meeting and also obtained the previous approval of the Regional Director having jurisdiction over such Nidhi. However, the private circulation of the details of fixed deposit Schemes among the members of the Nidhi carrying the words "for private circulation to members only" shall not be considered to be an advertisement for soliciting deposits. No Nidhi Company shall pay any brokerage or incentive for mobilizing deposits from members or for deployment of funds or for granting loans. One of the basic features of Nidhi Company is that it can only deal with its member. It is not allowed to deal with the general public. Anybody who possesses company’s share is known as a member. A minor shall not be admitted as a member of Nidhi. Further, Nidhi Company can only open branches if it has earned a net profit after tax continuously during three preceding years. After three years, a Nidhi can open up to 3 branches in the district. If the Nidhi Company wants to open more than three branches within the district or outside the district, it shall have to take prior permission of the Regional Director. No Nidhi shall open branches or collection centers or offices or deposit centers, or by whatever name called unless financial statement and the annual return (up to date) are filed with the Registrar. Deposits are more than two crores but less than twenty crore rupees. Deposits are more than twenty crores but less than fifty crore rupees. The total amount of deposits is more than fifty crore rupees. Apart from the loan limits, there is a restriction on loan to be disbursed against which security. Let us proceed on to discuss that part. Before moving forward, the golden rule for loans is that a Nidhi Company cannot lend any unsecured loan. Further, it can only give loan against the securities mentioned in the law. #Security No.1 – Gold, Silver and Jewellery: This type of loan is very popular in the community and is popularly known as a gold loan. The repayment period of such loan shall not exceed one year. The total value of loan should not exceed the 80% of the total value of gold or silver. #Security No.2 – Immovable property: This type of loan is known as a loan against immovable property. The repayment of this type of loan shall not exceed 50% of the overall loan and repayment period shall not exceed seven years. #Security No.3 – FD Receipts, National Saving Certificates, Government securities and insurance Policies: The loan against these securities are not very common. Further, in the case of loan against fixed deposits, the period of loan shall not exceed the unexpired period of the fixed deposits. Personal Loan: A Nidhi Company is not allowed to lend money as a personal loan on the basis of credibility or Income Tax return. The loan has to be against any security. Micro Finance – Small Credit: Microfinance business is very famous especially in rural and semi-urban areas. However, no company is allowed to do the business of microfinance, other than the registered NBFC. Vehicle Finance: The business of vehicle finance is also not allowed. The business of vehicle finance is also allowed only to a registered NBFC. These are all special categories and need a net worth of at least Rs.2 crores. Hire Purchase: The business of hire purchase has also been restricted to Nidhi companies. The rate of interest to be charged on any loan given by a Nidhi shall not exceed seven and a half percent above the highest rate of interest offered on deposits by Nidhi and shall be calculated on reducing balance method. Fixed deposits: The fixed deposits can be accepted for a minimum period of six months and a maximum period of sixty months. The maximum interest rate on fixed deposits cannot exceed the rate of interest provided by RBI for NBFC. The current rate of interest is 12.5%. Recurring deposits: The recurring deposits shall be accepted for a minimum period of 12 months and a maximum period of 60 months. The maximum rate of interest on RD shall be the same as in case of FD i.e. 12.5%. Saving deposit: The maximum balance in a saving deposit at any given time qualifying for interest shall not exceed Rs.1 lakh. Further, the rate of interest shall not exceed two percent above the rate of interest payable on savings bank account by the nationalized bank. We have tried to explain the basic Nidhi law in a very brief manner possible. However, it is recommended to consult the author before relying on any point above. In case of any doubt, please email us at info@hubco.in.